Kate Dahlke, a grad student judge (right), reviews the video a team of Uni High students made as part of their research project. 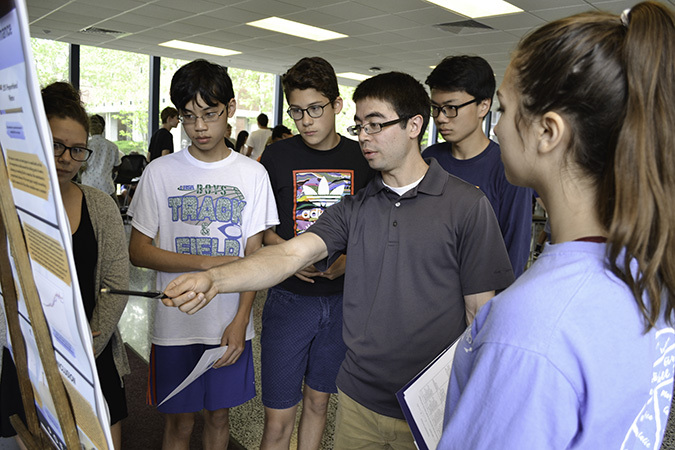 Although they might not have realized it, during the spring 2017 quarter, students in David Bergandine’s three chemistry classes at University Laboratory High School (Uni High) did research projects about heat pipes that were part materials engineering, part physics, and part chemistry, along with a lot of science. While testing twelve different variables about heat pipes, they not only gained a lot of general knowledge related to heat flow and heat transfer, but gained some very in-depth knowledge about the specific area they researched. Plus, in addition to learning what research is like, his students got to present their research at POETS' 2017 High School Student Research Symposium on May 23rd. David Bergandine (right) discusses his heat pipes lesson with POETS' Jessica Perez. Since later in the summer, he actually built a model heat pipe—and it worked—he decided that heat pipes had enough inherent variables to provide a high school research project. “It turns out there are about a dozen different things that could be varied that students could test,” he says. “So, we settled on that." A student explains her team's research findings. First students developed a list of things they could vary. After observing and researching heat pipes, they came up with about a dozen factors that they could vary to test. Next, Bergandine grouped his students based on their interests: which of the variables they were most interested in, and which of five skills needed to complete the project they were good at: designing the experiment, conducting the experimentation, explaining their process and results scientifically, making a poster, and making a video. David Bergandine by some of the equipment students used, along with some of the pipes they tested. “Then I tried to group people based on their interest in the topic, plus the skill set that they brought,” he explains. “I think we ended up creating fairly effective groups,” he says. There were twelve groups all total, four in each of his three classes. Next, his students began testing a number of variables regarding heat pipes. These included length; width; diameter; conductivity of the material itself, depending on how much mass was present; whether a solid material would conduct better than a hollow pipe; different metals; different fluids on the inside; and using wicking materials on the inside. Bergandine indicates that his students also tested to see if the volume of liquid mattered, going from no liquid inside to 25%, 50%, 100%, to see if they still got a certain performance. His students also tried water versus ethanol, and then mixtures of water and ethanol. Regarding the lesson's multidisciplinary nature, Bergandine calls it “really heavy-duty engineering in the sense that you have to build something that works, and that’s not always what a scientist does. But, on the other hand, we were also doing science in the sense that we were just discovering how materials behave." Jessica Perez (right) awards some students their third-place certificate. Also key to the lesson was the opportunity for students to present their research. The teams each created a poster and a video about their study, then presented them at an end-of-the-quarter poster session on campus on May 23, 2017. 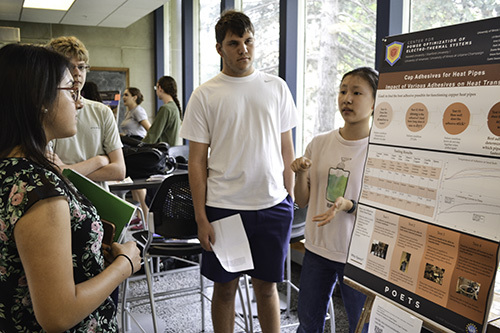 Because POETS is seeking to create short-term research opportunities and competitions for K-12 students, the poster session was also a competition. A group of POETS' graduate students served as judges, watching as each team of students presented their research via posters and videos, then judged the teams' work based on the quality of the research. Teams who won 1st, 2nd, and 3rd place got first pick of the numerous prizes that were available. However, every student received a certificate and got to choose a prize. Left to right: Joe Muskin and Jessica Perez converse with David Bergandine about his students' research projects. POETS' Jessica Perez (left) listens as a team of students discuss their research. One of Bergandine's students presents his team's research on wick structures in heat pipes. Bergandine adds that his students also learned a lot of basic knowledge about thermal properties and materials and heat flow and phase change, plus they became specialists in one of those areas. "Well, they start off knowing virtually nothing about a topic, and then they end up knowing a lot about their own area, plus they know enough that they can easily interact with any of these other groups and quickly understand what it is that they were doing…As individuals, they become sort of specialists in one area...capable of talking about it, presenting it, and so on." Gloria Sunderland by the research poster she designed. One student who learned a lot through the project was Gloria Sunderland, a sophomore at Uni High, who indicates that her group did length of the pipe as their variable. While they had “sort of inconclusive results,”(she said their 10 cm. pipe “didn’t really work at all"), she acknowledges that, "We did see that as they got longer they tended to work more effectively." She reports that, they “had to do a lot of research like the laws of thermodynamics and just heat pipes in general to see how they worked. Then after we figured that out, then we actually had to make them and actually heat them up with the ethanol in the pipes and then cap them so that there would be pressure." Sunderland also gained some insights about research through the project: "I learned that you can build a lot of knowledge through research and through testing things in real life. Hands-on experience does help you learn and really internalize the knowledge that you’re working on." Uni High student Harmen Alleyne (center) explains his findings on the effectiveness of metal heat pipes. Another student, Harmen Alleyne, a sophomore at Uni High, says his group tested the relative effectiveness of different metals when constructing heat pipes. Their results? Alleyne says copper is the best and stainless steel is the worst in terms of conducting heat. He also learned a lot about heat pipes through the project. “When Mr. Bergandine started the project, we had no idea how to construct a heat pipe. He didn't tell us or anything. So, we had to research how to make a heat pipe, research what kind of working fluids we can use and which ones we should use and how the different metals react and why they do that. We had to just research almost everything for this project. So, throughout the entirety of the project, we learned almost all of the workings of a heat pipe." Harmen Alleyne (just right of the poster) and his team of fellow Uni High student researchers. Tina Wayne exhibits some of the heat pipes they tested. Another student, sophomore Tina Wayne, says she learned about heat pipes and how they conduct energy. She also learned how metals' ability to conduct heat is related to their molecular structure. “I learned how metals' valence electrons impact how they conduct heat. I learned why we use the things that we do within our house.” For example, she learned that copper pipes are used for the most part in houses and in electronics because they have the highest thermal conductivity, and that aluminum pipes are a close second, as are pure metals. “Pure metals should perform better due to having more free valence electrons versus alloys." Wayne says that during the project, she learned about materials engineering, but some economics too: “My part was explaining why the heat pipe performed as it did. So, I went through a lot of different sites that both sold the different types of metals, and I went through research at different universities. So, I got to see the different type of academic standpoints versus economic standpoints and the viability of both." Wayne admits that she enjoyed the research. “I like doing research, she admits. “I had many questions going into the project, and through doing the research, I was able to answer my own questions and explain it in my own terms so that I could explain it to another person." A Uni High student presents his team's research to Kate Dahlkem one of the POETS grad student judges. He also hopes to “continue working with organizations like POETS and other groups on campus that would like to collaborate with us and give our students authentic research opportunities in the classroom, but also use those research opportunities to ensure that students are doing real science and learning what science is all about and not just learning about science." Story & photographs by Elizabeth Innes, Communications Specialist. Leon Dean, one of the grad student judges (center), discusses a team of students' research project with them.